Gabrielle Hamilton’s memoir Blood, Bones & Butter currently sits at #18 on the NYT Bestseller list. Not bad for a writer who happens to also be a full-time chef (and mom) running her own restaurant in New York City. While you can read a full review of Hamilton’s work here, I thought it might be nice to have a little extra book info “on the side” to spice things up. And by the way, I highly recommend. The East Village rests in the borough of Manhattan and lies east of Greenwich Village. Much like the maverick chef herself, the East Village has a rich history of both rebellion and creative vision, making it the perfect location for Hamilton. Once the upper part of the Lower East Side, the East Village began its transformation in the 1940’s as a hub of countercultural thought and artistic activity that drew bohemians from around the globe and continues to house the avant-garde to this day. For more on Gabrielle Hamilton, try this podcast on Splendid Table or this video of Gabrielle at Prune from Savory New York. For more on the area’s fantastic history and bohemian culture, try this episode from the PBS series American Masters. Reader beware – chef Gabrielle Hamilton’s memoir Blood, Bones & Butter is smoking hot! Serving it up raw and gritty, Hamilton is absolutely fearless as she slices through the chapters of her life. From her idyllic childhood as a girl in rural Pennsylvania to the tough, renegade chef presently rocking NYC’s East Village, Hamilton cranks it from page one with her edgy literary style. Through the simple joy of childhood memories Hamilton solidifies the family bond, and no event makes a deeper impression on young Gabrielle than that of her father’s legendary annual lamb-roast. It is this magical “feast” for hundreds of friends from “as far away as the townhouses of New York City” where Hamilton’s recognition of family and culinary senses become inextricably bound. When Hamilton’s parents suddenly split up, Gabrielle is left alone amidst the busted bones of her now broken family. Cash-strapped and only thirteen, she begins to work it the only way she knows how. Finding her way to the familiar, Hamilton begins to grind it out kitchen after kitchen working her fingers to the bone from New York to Ann Arbor through Europe, and back again. 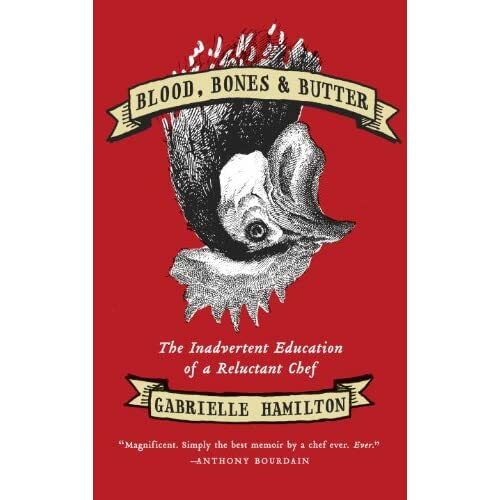 Ultimately, the all-nighters, crusty floors, endless prepping and the sordid yet seductive world of food serve to sharpen Hamilton’s artistic skills and caustic wit. I could toss up the cooking metaphors all day long, but in the end chef Hamilton writes like a rock star. Every page holds a killer quote and Hamilton’s hard-core intensity is intoxicating. Blood, Bones & Butter has serious moxie driven by the love and language of all things culinary, and its promise of family, friendship, and food is sure to please. **The edited version of this review can be seen at BookBrowse.com.